Yeah, but: There's no cinnamon. The Long Version: Almost twenty years ago I was introduced to Frisk mini-mints by a mutual friend. It was the Eucalyptus flavour. He got me to try them by recounting his own first time: "I thought they were like Tic-Tacs, popped five of them, and nearly passed out." They're that strong. 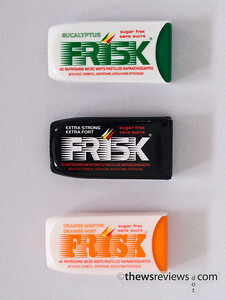 Frisk mints come in these little containers that are reminiscent of getting pills from a Pez dispenser. The mints are very small - more like the cross-section of a tic-tac than anything else - so the container is also nice and petite. It fits easily in a pocket, meaning that they're easy to carry and easy to pop. At 40 mints and about $3 (with tax) per pack it's not a cheap habit, but it beats smoking in just about every way. Eucalyptus (top in photo) was my first introduction to these mints, and it's strong enough to water the eyes of the uninitiated. Take them one at a time. The more typical mint flavour that I've tried (either Spear or Winter, I can't tell the difference) is much more mild and doesn't have the sinus-clearing power of the koala-bait. There's also the extra-strong 'Black' (second in photo), which is close to Eucalyptus in potency but not as striking. But the real hidden gem of the line is the Orange flavour, which is exactly what I remember Children's Chewable Aspirin tasting like. Since I'm in a perpetual quest to recapture the happiest parts of my childhood, this is a real win for me. Never heard of them, but will look. Re: Orange flavor--Many years ago while touring with a band I found out by accident that the strippers in Corpus Christi TX go crazy for orange TicTacs. Still have a bar napkin with 7 phone (and pager!) numbers on it. That mix of happy strippers and children's chewable aspirin flavour is going to haunt me. Matthew, I laughed and laughed after reading yours!